The FluoView FVMPE-RS series of biological microscopes from Olympus is widely used in life science research. Its high-speed scanner allows observation of ultra-rapid biological responses, and the system can obtain vivid images from as deep as 8 mm below the tissue surface. Two new configurations now expand the FluoView FVMPE-RS series beyond the original upright frame version introduced in 2013 to offer even greater scope and flexibility for research. The new configurations also open up a wide range of observation possibilities suited to imaging a greater variety of biological specimens. 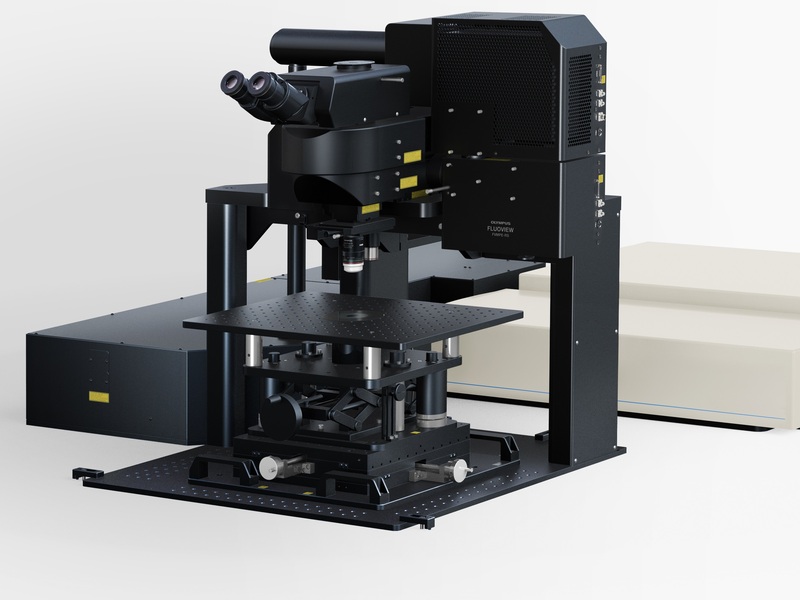 The Gantry microscope frame features an ultra-stable arch-like structure that allows considerable space beneath the objective to accommodate experiments of varied sizes. A volume of 640mm wide, 355mm high and 520mm deep is available if the stage is removed, providing sufficient space for the researcher’s own experimental apparatus and providing flexibility to suit different observation purposes. The inverted microscope frame is ideal for observation of cells in three-dimensional (3D) cultures, where multiple layers of cells are cultured in a petri dish or similar vessel. Because inverted microscopes allow the researcher to observe the sample from below, this configuration is optimised for 3D-culture imaging and allows cells that have adhered to the base of the petri dish to be observed without culture fluid touching the objective. Multiphoton imaging is a microscopy technique used in the life sciences to elucidate the role and function of proteins or nerves, and to seek out important data related to drug discovery. For example, in the case of cerebral nerves, scientists need to observe biological responses at sites far below the tissue surface, both to study the nerve mechanism and to develop therapeutic drugs or other treatments for diseases such as cancer or Alzheimer’s. Relying on Olympus’s renowned optical and digital technologies, the FluoView FVMPE-RS multiphoton laser scanning microscope systems meet the needs of researchers by helping them capture images and movies of rapid biological responses deep within samples.